I'm all about the packaging at the moment. That's the inside of a gatefold CD single by the Bristol band Santa Dog. 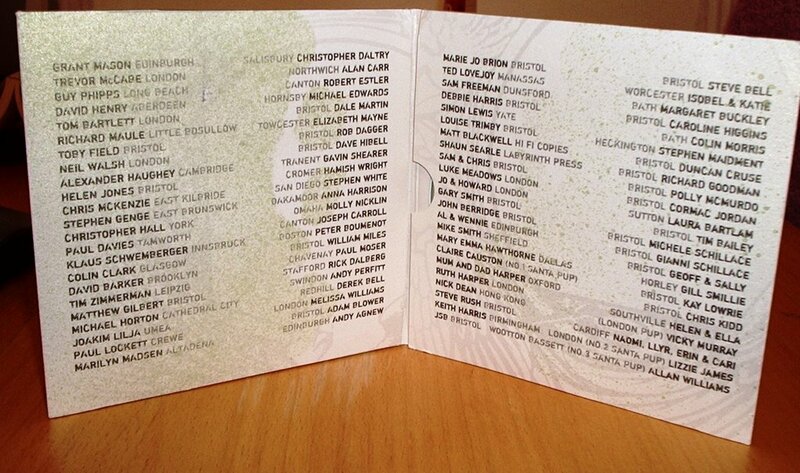 Limited to 100 copies - and the 100 people who pre-ordered it got their names and home towns printed, as you can see. I'm sandwiched in between Colin Clark from Glasgow and Tim Zimmerman from Leipzig. A lovely place to be, I'm sure. If you want to listen to some Santa Dog, you can do so here. That's a 7-inch single by Midlands band The Sequins. It's a work of beauty - a gorgeous red sleeve that comes wrapped in a muslin-like fabric with black roses crawling from right to left across it. The Sequins are like an English version of Voxtrot, perhaps a little more angular and jangular - with maybe a hint of Feargal Sharkey's young voice. Can't find any obvious downloads, but go to their Myspace here and listen to "Happy Chappie". And finally, a band whose packaging I have yet to discover, although I've ordered their EP from Sweden. They're called Gentle Touch, and you could try listening to their song "Smedby" here. I've no idea what or who Smedby might be (sounds like a podgy Liverpool left-back from the mid-80s), but this song is majestic. It's perilously close to being a pastiche of OMD, New Order, Depeche Mode synthpop, and sounds like it should play over the closing credits of the best movie John Hughes never made. Despite (or because of) all that, it's magnificent.